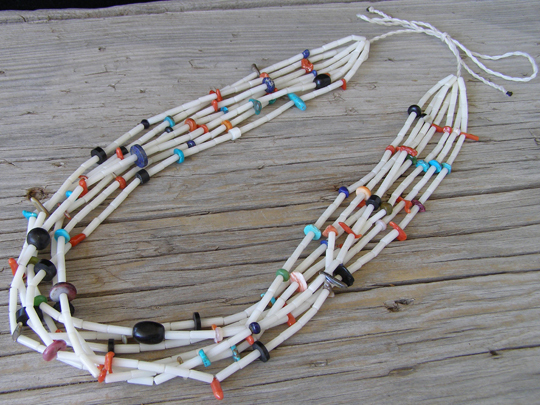 This is a seven strand treasure necklace which consists of seven strands of handmade white clam shell tube beads with a variety of different beads strung on the strands. All of the colorful beads are from necklace projects that Chris has done through the years. A treasure necklace is strung with the remnants of various beads used on past projects, hence the name. The beads, therefore, are made from a variety of materials and in a variety of shapes. This is strung on traditional beading string. It can be tied as short as 22", or as long as 36".